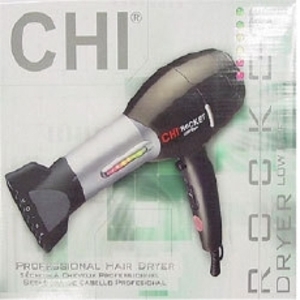 I recently splurged on a professional hair dryer while I was at DeRiah Salon and Spa Its the Chi Rocket Hair dryer. It is quiet and powerful and dried my hair so fast that I almost styled it incorrectly because I was not paying attention and my hair was dried in half the time of normal! It has a great “cool burst” button and is ionic and leaves my hair really shiny! The best part was the tip on the end has slight ridges in it, so you can use it in combination with your brush to smooth out your hair! Its never looked better!